Apps on Apple’s Mac App Store are beginning to be updated with Retina-ready graphics, ready for the rumoured launch of new high-resolution Mac Retina Displays. Approved this morning, Mac App Store tool Folderwatch — an app that monitors, syncs and mirrors important files automatically — included a small detail in its update notes, stating “Retina graphics” were a new addition to the app. We reported earlier in the week that Apple may have plans to announce updates to many of its Mac computers at WWDC. 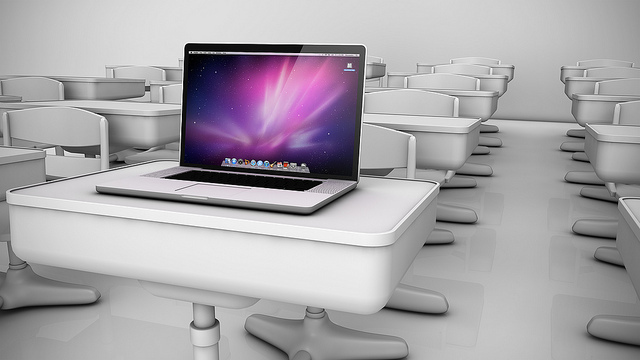 The models to be updated include the 15″ MacBook Pro, the 11″ and 13″ MacBook Air models and the iMac. All of the various portable models being updated are rumored to be getting a Retina display boost. While it is easy to include a reference to a Retina-ready Mac app in an update, Apple will have approved the application before it went live. Mac App Store developers could possibly have been notified of a Retina display upgrade or are simply anticipating a refresh, adapting their apps ahead of Apple’s WWDC event next week. Apple just approved FolderWatch 2.0.4. The app is ready for retina displays and comes with a couple handy new features. 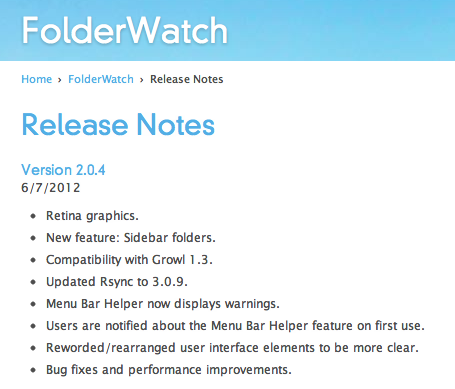 Folderwatch was featured as an Apple Staff Favorite in June 2011, perhaps signifying why its developers — Brothers Roloff — could have been given a heads-up. Either way, we have reached out for clarification. It should also be noted that Apple has been stating that it will include HiDPI support for the past few years, meaning that many developers will already have included artwork that can support a higher resolution display. Only now, after Apple approved an app with “Retina graphics” in its description have we seen more specific reference to the Retina ‘brand’. We previously discussed the possibility of Retina displays in Macs, concluding that they would pose a technically intimidating, but not insurmountable, challenge for release in 2012. Specifically, a 3840×2160 pixel display would more than double the pixels, have plenty of room for a 2048×1526 app mockup image and be easier to pack into a MacBook-sized screen. If Apple cut a deal with Sharp — which has begun to ship panels of this resolution — to supply Retina displays for the iPad 3 then may have been able to leverage its partnership to score an lower price on panels for its Mac lineup. We are currently looking into the app to determine the extent of the Retina graphics and will update the article should we find out more information.